Public Domain use of this e-book is granted to Wikipedia and all other not-for-profit institutions. 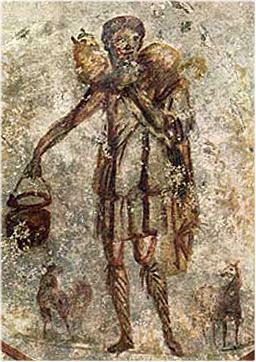 Cover photo is Jesus as the Good Shepherd - a painting on the ceiling of the S. Callisto catacomb from the mid 3rd century - making this possibly the earliest known image or portrayal of Jesus, source: http://commons.wikimedia.org/wiki/File:Good_shepherd_02b_close.jpg . Youvan’s e-book, below, “Questions of a Christian Biophysicist”, ISBN 978-0-615-43573-2, is written entirely in the form of polemic questions. These 800+ questions indicate Youvan’s firm belief in Biblical Creation as per Genesis 1-2. While some questions are at research level in mathematics, cosmology, and biophysics, other questions pertain to a broad spectrum of basic subjects ranging from family relationships to Wikipedia politics to child education. Some questions are written for fellow scientists, teachers, apologists, and pastors that have answers bordering on paradoxical or indeterminate. Doug feels called by the Great Commission of Jesus Christ to “extinguish Darwinism” and spread the word that “an intelligent man can believe in literal Creation”. He is credited with finding a pattern in the genetic code which is inexplicable by any Earthly process. His questions hit hard at secularist beliefs in the Big Bang and Evolution. His discovery of a pattern in the genetic code is published here on Wikipedia's genetic code article which receives nearly one million hits per year. Youvan received his Ph.D. in Biophysics from UC Berkeley in 1981 and advanced to the level of Associate Professor of Chemistry (MIT) in 1990. Discovery of the genes for photosynthesis, invention of in vitro evolution, and discoveries in discrete mathematics are attributed to Youvan, who was later Born Again via epiphany at age 46. Youvan has attended a variety of Christian churches, including: Catholic, Calvinist, Calvary, Methodist, Baptist, Southern Baptist, Nazarene, Pentecostal, and Charismatic neo-Pentecostal in a variety of states including Kansas, Colorado, Hawaii, and California. For readers interested in Mathematica programming, color, and/or the discrete mathematics used to study the genetic code, Professor Youvan’s first e-book is also free and online: “Pseudocolor in Pure and Applied Mathematics”, ISBN 978-0-615-43125-3, at www.youvan.com. For more information on Youvan, himself, please see his current Wikipedia biography at en.wikipedia.org/wiki/Douglas_Youvan. His biography is frequently attacked by atheist editors, so you might want to view an earlier version of his biography in Wikipedia's history shown here. All questions are in chronological order of writing with the exception of the first and last questions which were written in November of 2010. Work on this book began in October of 2010 concomitant with this web-based publication. The 650th question was written in April, 2011. If you are currently reading a paper copy of this book, that's probably from a short printer run, and it is likely that the e-book on the website is more up-to-date as more questions have been added. Do you find the following quotes and comment from Darwin, Crick, and Jukes to be troubling? Are these Four Postulates consistent with Biblical Creation as per Genesis 1-2? Humans can not observe the origin of life on Earth. The information content of the DNA in a living cell or organism is insufficient to encode life. The information for bootstrapping life into existence is not present in DNA. The information required to bootstrap life into existence came from an NP or a non-algorithmic process. Why did Francis Crick and Thomas Jukes want to hide the pattern they began to see in the Genetic Code? Who coded the genetic code? Do we live in a largely secular world explained by a Darwin-Hawking tautology? If you can't prove that time moves forward, then how can I accept evolution as fact? Do people assume there is nothing after death because they can remember nothing before birth? What would be common ground for Darwin and Hitler in a hypothetical debate? Given Darwinism is based on faith, how can it be taught in school where church & state are separated? Are the "time-like" and "space-like" areas of the Einstein's space-time continuum equivalent to P and NP? Does the original Hebrew for "In principio creavit Deus caelum et terram" imply the creation of time, itself? Why do people make a game out of destroying each other? Can you forgive faster than the Amish? Do you ponder: "Buddha and Christ, would you have us choose between Nothingness and Love, respectively?" Do "Things go better..." after death? Does believing Genesis in literal terms effectively discredit my Ph.D. in Biophysics? How many born again university professors do you know? Do you think much about staying 'fit' so your offspring will survive to reproduce? What do atheists gain when they experience suffering? Do you change your behavior towards a stranger in public when you notice they are wearing a Christian cross? Have you ever wondered whether our brain's Amygdala is tuned to God? Do you agree with Søren Kierkegaard that Christianity seems to be offensive before it can be understood? Is the hatred directed at Israel really a hatred of God? For evolutionary selective advantage, should you kill your enemies so your children have a better chance of survival? What's your evidence that the Christian God is lovelike while the Muslim one is not? What's worse for kids: TV, Darwin, or the Big Bang? Can you name a False Prophet? Will the day come when lies fill the world, and no child born thereafter can discern right from wrong? Did Adam and Eve enjoy their sexuality before the Fall? Does the Big Bang and Darwinian evolution explain the origin of mathematics and music? Does Hawking really believe that a Supreme Being lives in black holes and emits particles named after him? Is Hawking the current God of the scientific secularists? After inventing P vs NP for our pleasure, did God leave us in physical and mathematical NP? Having descended from Isaac, must we now battle the sons of Ishmael to complete the Great Commission? Does the information content of a cell instantaneously eliminated of its DNA exceed the information content of its DNA? If some knowledge is outside of man’s ability to know, then who would know? Is a person defined more by the questions they ask, or the answers they provide? How could a physicist prove that the problem he was studying had no underlying and/or solvable mathematics? Does acceptance of Darwin somehow promote abortion, in vitro fertilization, stem cell therapy and/or eugenics? Sometime in the future, will valid scientific challenges to Darwinism be considered "hate speech"? Has Dysgenics now taken the form that the rich are superior to the poor? Could we be on the verge of genetic engineering experiments wherein human pain and suffering do not matter? Is there an analogy between St. Peter and the Karolinska? Can Spiritual Warfare arise against a person writing in support of literal Creation? Why is the Physicist and Cosmologist, P.C.W. Davies, being attacked over issues of faith? In church, why do we say we are "the people of God", when we really do not know God's will? With a Venn Diagram, can you see God as the superset, mankind as a circled subset, and Salvation as a break in the circle around man? Do religious writings make you hate the writer or the religion or God? Do human secularists really believe that the elimination of religions would stop wars? What is the difference between a person that was a Believer from childhood and a person Born Again at an old age? Is it possible to believe in Christ but find Satan to be fiction? What is the lie behind Darwinian Evolution and The Big Bang that causes people to be blind to God's Creation and Procreation? How do you explain the simplest and most beautiful things about our world to children without invoking God? Can any advocate of The Big Bang explain how a "singularity" creates space, time, energy, and matter? Do some churches delete literal Creation from their doctrine to increase membership and tithings? Is the forward direction of the "arrow of time" defined only by the first three words of the Bible? Was Einstein's vision of a one dimensional space-time with four variables (x,y,z, -t) inspired by God? Why did God assign a "minus time" variable to space-time and have the space dimensions assigned positive? Without God's Word, are we left with the Boltzmann H-theorem as the best scientific guess as to why time moves forward? Why did God put something as simple as the Lorentz factor into Relativity? After Heisenberg, why did Einstein turn towards dice (and a non-existent unified field theory) instead of God? When was the population of the Earth 100% Christian? When was the population of the Earth 100% Jewish? If a non-Believer partially denies the touch of the Holy Spirit, will they be perceived as having a psychiatric disorder? Are seditious comments the result of having no personal God (Jesus Christ) in whom one yields their vengeance? Do human secularists and Christians agree that "all men are Created equally"? In the conversions of the Latin Vulgate into the KJV and then into the NIV, did "brother" become "brethren"? In your family life, do you tell "white lies" to make family relationships more peaceful? In your business life, do you have to lie to make products sell better? Would an "Institute for NP Processes in Biology" degenerate into faith arguments or help develop new drugs and therapies? Akin to the nonsolvable 3-body problem or the quantum mechanics on chemical bonds, can NP processes be modeled as perturbation of P processes? Can a Prigogine Dissipative Structure store information like a cell stores DNA? Are there DNA-based limitations to the lifetime of the biosphere? Would a discrete mathematician have fun playing board games or would it seem like more work? In terms of Darwinian Sociology, is financial wealth now the measure of fitness? If Darwinian Evolution was false, would any known technology fail? Is the creation of sentience a second NP process following the creation of life? Do scientist really believe they become immortal and god-like when they win a Nobel Prize? Did James Hutton give Darwin "enough time" through Gradualism solely to attack Creation? Before 1900 geologists spoke of pre-and post-flood eras as being fact, so what changed? In opposition to Creation, why do geologist use inexact science to explain crystalline minerals, coal, oil, etc.? Is "Dawkins" a popular and effective name because of a genetic algorithm of "Darwin" and "Hawking"? Do scientists believe that the isotopic preference of RuBisCO is unchanged over time simply to support radiocarbon dating? Does loss of faith in God and science result in illicit drug usage? Do offensive questions written by a Believer keep you from moving closer to Christ? Has scientific data been selectively "mined" to support Darwinism and Evolution? Did God create planets and quasars to entertain man? Isn't the Strong Anthropic Principle easier to believe than the Darwin-Hawking tautology? How much faith does it take to go from red-shifts and 4K to a geodesic singularity? Why did God balance photosynthesis and combustion with a red-shift of absorbed and emitted light? What's' worse: Pushing Dawkins', "The God Delusion", or pushing drugs? After you interpret Genesis 1-2 as fiction, how can you read the Ten Commandments as God's literal Word? Will a "Jesus Ministry" fail after Creation is discarded by a church as a myth? Was there a time when leading university professors were Christians? Do you feel the Holy Spirit strongest when you are laying hands on a person during a Faith healing? Could the reaction to an unfair inheritance 100 years ago continue to cause a family demonization? What would happen if NASA placed a china teapot between the orbits of Earth and Mars? Given the separation of Church and State, how can NASA promote programs with atheist-based exo-biology? Why doesn't NASA promote its programs based on imaging the beauty of God's Creation? Given Romans 13, as of 2010, has God given Wikipedia the authority to establish "consensus truth"? Did the 1960-ish lies that destroyed the nuclear family also cause massive demonization? Does the knowledge and truth you leave behind decay quickly in your dead body? What if Adam and Eve had simultaneously eaten of both trees? What would you be if there were no God? What would you be without Jesus? Was St. Jerome inspired by God while compiling the Latin Vulgate? Is there any other explanation for languages other than the fall of the Tower of Babel? When a prophet speaks, do you listen? Do you appreciate your unique design? Pun and spelling intended: Is the mathematical basis of evolution and bang theory holey? Did the perfect genomes of Adam and Eve overcome the deleterious effects of inbreeding? Why do churches conduct Bible Study out of any other book but the Holy Bible? Why do some individual churches claim to have a speciality, such as in "personal relationships"? Have you ever taken classes in Spiritual Warfare? Were there two creations of man by God (Genesis 1:27; Genesis 2:7)? Does John 14:13-14 imply that your prayers to be rich will be answered? Will there be exactly 144,000 Israelis remaining after a nuclear attack? Why does the KKK think the mark of Cain is Black skin rather than blue eyes? Is Akiane's portrait of Eve the correct racial composition? Did Jesus ever speak of personal liberty or freedom of speech? Was freedom of speech simply a response to having the doctrine of a church reviewed by a government? Is it illegal for churches to unite to form a new government? Who, after death, would pick physical darkness over brilliant light? Do we all get into Heaven freely by a big and unrevealed surprise analogous to the difference between the Old and New Testament? Why are Wikipedia articles usually ranked first on any search of anything? Is the love for control of information equivalent to the love of money? Can God call you closer and bring about better works by causing you to suffer physical pain? Did God use a solution to The Travelling Problem (TSP) in Creation? Is Russell's teapot delusional or does it at least entertain the idea of God? Will the Lord burn me as a brilliant fire to spread his news? What if NP problems are relatively simple compared to mathematics we can not even state? Does the Lord's Prayer bother you? Is it Satan or our free will which stops us from focusing entirely on Eternity? Would you be able to converse with someone whose Faith was perfect? Can knowledge or truth be engineered into the unwritten assumption of a polemic question? Are you strong enough to face demons or do the people around you repent? Is Faith real, and religion is something that happens in buildings? What does it say of Science when it is closed to theories on the origin of life and mankind? How much information is required to set the concentrations of thousands of interacting chemicals in a cell? After setting chemical concentrations in a cell, how does dispersive kinetics maintain a living equilibrium? Is dispersive kinetics more difficult to solve than the Travelling Salesman Problem (TSP)? How could anyone believe, with certainty, that an open thermodynamic system can generate and store information? Is Jupiter's Red Spot alive? Is the solar-geo-bio-sphere one living organism that uses elements heavier than Helium from earlier stellar evolution? Does the Strong Anthropic Principle explain why you evolved to read this question despite astronomical improbabilities for our existence? Are most US Presidents "Young Earth Creationists" who believed Genesis 1-2, literally? 10,000 years after Creation and 1,900 years after Christ, why did people begin to believe that Young Earth Creationists were stupid? When you awake and you have thoughts away from Him, do you go back to sleep until you get it right? Are you now part of Acts 29, but you are afraid to speak out for fear of martyrdom? Why did God use something as simple and powerful as the-speed-of-light squared in mass to energy conversion? Other than "blue collar work", is there a profession that yields peace of mind and financial profit? Will Pentecostals read these questions as demonic? Does speaking in tongues edify the individual whereas prophecy edifies the entire church? Do weak people go to strong churches? Should your local pastor show he has an international following to strengthen your church? What happened to the idea that ontogeny recapitulates (Darwinian) phylogeny? Will Darwin fall like Haeckel? Do your Spiritual Gifts adjust when you move to a new church so as to fulfill the local Body of Christ? Why do women and gays have more patience than men for teaching children out of books? Why do some young heterosexual couples decide not to have children yet gay couples are willing to adopt? As God reiterates in the Bible that He hates divorce, do you believe Him? Knowing these questions, why would a God-fearing Muslim want anything but for me to convert? What is the Protestant Work Ethic? Would you agree that your family is a Blessing and not a job? Why must a Christian Apologist sometimes disassociate himself from churches? Would you agree that the Antichrist is simply the sum total of all lies told against Christ's teachings? Are "your neighbors" the closest people to you in church or the people who live nearby? Why do some people have no questions to ask of God? Are these questions sillier than the ones Job asked? Do people turn toward beliefs in extra-terrestrial intelligence to avoid God? Do Biblical "strongholds" and bitterness arise from an inability to forgive and forget? Must one forget an incident after they forgive the wrong-doer? If you were elected to government and you asked your aids to research a subject, would they find "truth" on Wikipedia? If the Blessed Virgin Mary was without sin, why would we need our Lord and Savior, Jesus Christ? Why would an atheist find gain in swearing at God or Jesus Christ? Would the Lord call me to defend the Book of Genesis after leaving me as an atheist and educated biophysicist for my 46 years of life? Why would anyone, including myself, believe that I am a Christian Apologist for the Book of Genesis? When referring to science as authority, why isn't the term "faith in science"? Do you believe children are born as your free will or as an act of God? How many people call their child an accident? How can someone look at a tree, or a cloud, or the stars, or the love of a companion and not see God's Creation and Procreation? Why doesn't the fire of Hell scare people? Does the "equals sign" (=) become inexact when moving from pure mathematics to physics? Are all equations in physics just approximations? Are most of the recent social problems in the USA due to a detour that bypasses "One Nation Under God"? Is man's free will limited by God's knowledge of the alpha and the omega? As our legacy is only a Spiritual Legacy, should not our children come first? Can you divide mankind into two parts: Those who place children first and those who do not? By Romans 13, do you obey people with authority over you as if it were God-given authority? Are you a slave of Jesus Christ? Are you proud of your achievements instead of giving the attribution to God? Did you know "there is nothing new under the sun" applies to inventors? Why does my scientific family now refer to me as an illegitimate scientist? What has Jesus Christ done for you today? Theism or Vitalism, which is your choice? Will the day come when "Christ" is just a syllable with no meaning in the word "Christmas"? Do you believe science has a sufficient vocabulary to define what is and what is not alive? Have you ever met a person who professes to be anti-Christ but was raised within a strong Christian family? For how many seconds can you mimic the sinless character of Jesus Christ? Should we think of the end of the war in Heaven as being in the future tense? But for the Will of God, did you know that your last day on Earth could have passed by now? Why will you not accept unanswered questions? Why does it seem unjust that millions of Buddhist monks are headed for Hell? Is Hell literally burning Sulfur, or is it simply an eternal separation from God? What possible benefit can there be for betting against God's existence in Pascal's Wager? How could chirality arise from a Big Bang? Based on many occasions of small decisions each, how many parallel lives could you have lived? What is the shortest amount of time that you can remove from your life without consequence? What is the smallest change in the position of matter that is of any consequence to your life? Who would you prefer to have control over the "present moment" in time, you or God? Who does have control over the "present moment" in your life, you or God? Does it seem to you as if the Book of Revelation changes every time you read it? What exactly were those "unreal solutions" in the Schrödinger solution of the Hydrogen atom? Is your personal genome dependent on events that took place half a billion years ago in a bacterial population? Not all mathematics is embodied in physical phenomena, and vice-versa, correct? If you were the designer of all life on Earth, would you sign the genetic code? Is it easy for you to see God's signature on beautiful things in this world? Are the limitations of our language one of the reasons why Genesis 1-2 is written in such simple language? Is Genesis 1-2 written in simple language so as to be a first book for children to read? Is Creation so complex that God can not convey to us how he created the universe and man? Is it not ironic that after sinning to obtain knowledge, man would then act knowledgeable by denying Creation and Procreation? Can it be anything but God's covenant with Noah that has prevented our own extinction through biological and nuclear war? Are God's mathematics and music so advanced that we as humans can't see or hear Him? Did you know the consensus truth on Wikipedia is that evolution is fact, not just a theory? Did you know that according to Wikipedia (Godwin's Law) just mentioning Hitler causes you to lose the debate? When there is no way to disprove a theory, does the acceptance of that theory as fact generate a religious view? Do you believe there is more than or less than a one thousand fold difference in Heavenly versus Earthly justice? Do you believe that legalism destroys joyousness? Do you take the warning of Rev 22:19 seriously? How has genetic engineering and genome sequencing influenced Christian Apologetics for Genesis 1-2? But for the Fall in the Garden of Eden would mankind show any curiosity? Does your child know the difference between fictional cartoons and cartoons that depict Biblical history? Does your child believe that God created everything? Does your child believe that Adam and Eve were the first two people? What is the youngest age of a child you have personally known who is mature in their belief that Jesus Christ is Lord and Savior? Are you proud of your beliefs? Is God's Procreation under attack when people refer to an unborn baby as a fetus? Do you think that mankind will ever have the knowhow to design and construct a sentient machine? Why does SETI hear nothing? Are sentience and intelligence separable? Does the Bible seem to give us instructions for caring for each other that sound socialistic? Absent God as the designer, would a human brain be anything more than about five pounds of matter? Do you see a progression in the level of engagement churches show in worship ranging from Methodist to Charismatic Pentecostal? Would not science advance rapidly if "GDI", God Did It, became an acceptable answer to faith-based questions such as the origin of life? Have you ever considered giving Satan the nicest chair in your house in which to sit? Is it true in both science and religion that the simplest of statements is the most profound? Is the term "secular fascist" hate speech? While trying to establish the consensus truth, has secular fascism generated a body of lies? If a research group's livelihood required getting the "right results" for grants, do you think they would mine data? Given the ages and medical conditions of people buried in a graveyard, could you construct an evolutionary ape-man skull phylogeny? Why is it that the earliest writings of man correspond roughly to the date estimated for Creation from the Old Testament? Are the dinosaurs extinct for about the same reason that millions of buffalo are "extinct" from the Great Plains? Did you know that an attempt to list the Amish as Young Earth Creationists on Wikipedia was quashed? In human relationships, do you look for what Christ's perspective might be and then act accordingly? Simply over the love for money, could one begin to hate their wealthier brother and destroy a family? Why would God make the solution of the Hydrogen atom known to man by the use of simple raising and lowering operators? Is it a coincidence that our trichromic eye (R,G,B) is designed to see colors in an orthogonal manner analogous to the 3 Cartesian axes (x,y,z)? Can evolution theory predict what species and functionalities will evolve next out of the Earth's current organisms? Does evolution theory forecast that evolution has ceased or been diverted by the influence of man and his technology? At any given time in the progress of science is there not a finite chance that what is then known is all that can ever be known on a specific topic? How can there be no known process in physics for the spontaneous increase of the complexity of a system, yet evolution leads to increased complexity? If our top public universities hire based on intelligence, and belief in Creation is considered ignorant, then is there not a conflict of church and state in university hiring? What is the driving force behind the synergism we see in the biosphere? Would not evolution have failed to produce a complex and diverse biosphere if at any time during the evolution of the current biosphere the system had lost its syngerism? How many present day organisms within the biosphere would adapt and/or survive if the Earth's composition and climate slowly returned to the postulated (earlier) Jovian environment? Have you ever been struck by the notion that those who do not believe in God are acting in a sort of childish or immature manner? Isn't it amazing that we have looked for intelligence elsewhere in the universe and yet by the 1960's we had a clear indication of design in the genetic code? How much clearer could it be that the genetic code could not "evolve" to an optimized design before evolution purportedly even began? Given the astronomical unlikelyhood of converging to the same universal genetic code, wouldn't evolution theory have to claim there is a single ancestral cell to all life on Earth? If one wants to avoid a GDI explanation for the genetic code, wouldn't panspermia be better than evolution in explaining why we have a single, universal code? If you were designing a panspermic delivery for another planet, what would be in the payload? Would you do multiple panspermic seeding of a planet with more complex organisms arriving at later times? If God thinks in nonverbal terms, would we recognize those thoughts as things like music and mathematics? As a Christian, does it trouble you when you tell others that Christ is the only way (exclusive) to an eternal life with God? If a pattern was discovered in the genetic code, it would not be of Earthly origin - correct? Since there appears to be a strong pattern in the genetic code related to amino acid hydropathy, why is this escaping mainstream scientific study? In describing macromolecules such as DNA and proteins, would it not be better to say "design, structure, and function" rather than just "structure and function"? Is DNA functional only within certain "boundary conditions" that are conditions not encoded by DNA but are pre-existing in the chemical makeup of a living cell? Is it not abundantly clear from the sequencing of various genomes that the information content of DNA is insufficient to reconstitute life? Is it frustrating to you to see scientists trying to explain every phenomenon in the universe, including man's behavior, without invoking God just once? Two hundred years after Pascal, do you think it surprised Mendel that his pea genetics data could be explained by simple logic and math? Do you see a (computational) analogy between the making and breaking of hydrogen bonds in cells and the switching of semiconductor junctions between on and off? As distinct from aqueous and homogeneous in vitro biochemistry, do you see compartmentalized non-aqueous activity coefficients as preexisting conditions for DNA expression that are not directly encoded by DNA? How can the algorithms and methods for producing a phylogenetic tree (based on ribosomal DNA sequences) be justified, checked, and/or improved? Do you think brain biochemistry and medical imaging will advance to the point of showing why Pachelbel's Cannon sounds Heavenly? Does the Bible prophecize a world leader (who has direct control over a nuclear arsenal) living in a dreamlike state where rational logic, life, and death means nothing? Lord, do we have to suffer through more Hitlers before you return? Are we to continue Procreation when (Mark 13:17) applies: "How dreadful it will be in those days for pregnant women and nursing mothers!"? Although we are not to know the hour nor the day, does Mark 13:17 suggest a cessation in childbirth amongst Believers during End Times? The verse 2Peter3:8, "With the Lord a day is like a thousand years..." does not apply to Creation, correct? Unlike most other fields of study, should not mathematicians be pleased that they are free to work with some unadulterated knowledge? Do you believe that Acts continues to the present time, with spiritually gifted prophets and apostles living amongst us? Much like the concept of "innocent until proven guilty", don't you think it would be wise to assume there is a God until His existence is disproved? Can you think of a way to balance the words of a strong and persuasive pastor with accurate doctrine? How do you make a charitable gift to the children of a family when you know the money will also be used to facilitate their parent's drug and alcohol habits? Is mocking the Holy Spirit the only unforgivable sin? Do you ever feel torn between good works and interacting with people who dislike you? When you write, do you frequently visualize a specific type of reader who may have views entirely different from yours? Explained not as pride, but rather as service to God, shall we help direct our youth to set their goals high? If you have moved from church to church during your life, has it felt like turning the pages of a book? As a visitor or new member to a church, do you often try to follow the pastor's sermon by recalling expository chapter and verse for accuracy? Do you find that there is no previous part of your life that you would want to relive? What is the duration of time for any part of your life that you would want to relive? What kind of a relationship could a husband and wife have if one was Born Again and the other was an atheist or Buddhist? Given that Creation was approximately 10,000 years ago, have you thought about planning your next 10,000 years? Among Believers, what will be the consequences of our multiple marriages if we enter Heaven? Of the two billion people on Earth that call themselves Christians, how many believe that they will be held accountable to the Lord through the Book of Life? Why was Thomas Jukes given an unprecedented amount of freedom as an editor and columnist for Nature magazine in the 1970's? Have you made it to a point in your life where your family would survive and your Christian legacy would continue if you were to die? Have you noticed that Einstein's proof of relativity is rather unconventional and vague? Have you noticed that the physical chemistry proof involving scattered light that creates the rainbow is also rather unconventional and vague? Do you believe that God's unique design of a person is complete at the time they become diploid with union of ovum and sperm? How can a partially evolved biochemical cycle, that is nonfunctional during evolution, convey fitness for the host organism to be selected? How can biophysical structures evolve (e.g., the photosynthetic reaction center) that are so complex man can not even mimic their function? Would you agree that a Christian author is more limited in what he can say against a living man compared to an "ism" left behind by a man? Do you think anyone has calculated the ratio of truth-to-gossip posted on social networks such as Facebook? If tomorrow you found yourself set for life (financially), would you turn your everyday work towards something more pleasing to the Lord? Why are scientists one of the most difficult groups of people to reach with the Word of God? Looking around at our world with its biodiversity and reserves of fossil fuels, doesn't it make sense the Earth is only about 10,000 years old? Do you see any reason at all to reduce the literal and historical accounts of the Bible to allegory, fables, or analogies? Do you think that a person who reads the Bible alone and without fellowship or a church can drift into misinterpreting doctrine? Would there be a change in the level of church attendance if physicians ceased prescribing pharmaceuticals for grief, depression, pain, etc.? In the progression of indulgence to overindulgence, when does such behavior become anti-Christ? Did you know that the only place you will find true love and absolute Truth during life is from Jesus Christ and the Holy Bible? Could the maturity of a scientist be gauged on how many caveats they have found to the idea that science can solve anything? How can anyone see Justice and Truth arising from evolution rather than God? Is physical infinity the same as mathematical infinity? How do Darwinists explain the apparent absence of substantial teratogenic germ-line damage to humans over the past few million years? For Darwin, the predator of the species that preys on my species is my symbiant, just as the enemy of my enemy is my friend, correct? In both religion and science, would you agree that the most productive people who have ever lived are now in our past? If you had met Jesus 2,000 years ago, what emotions do you think you would have been able to feel from Him towards you? Have we become so weak that wine has become water (i.e., grape juice) in Holy Communion? Has Holy Communion been influenced by State laws and insurance companies as to minors in possession? Why invoke celibacy in the clergy if a man is the husband of but one wife? Why create rules for a congregation concerning casual drink if the only man commanded never to drink was John the Baptist? Where will you be when will all nations turn against Israel? By what methods and criteria do you define your identity as a living person to other people? How can a historian write an accurate biography if they are incapable of understanding the spiritual beliefs of the person? Can you visualize a world wherein "discern" and "advertise" have exact opposite meanings of each other? Are scientists constantly tempted to conclude doctrines of causation when observations supports only correlation? If one of the measures of the scientific validity of a new theory is the ability to predict yet unseen phenomena, what has Darwinism predicted? Why would I debate a Darwinist if their best evidence that time moves forward is the Boltzmann H-theorem? If science convincingly proved evolution false, would the next best theory among secular humanists be panspermia? Does Genesis 1-2 indicate that God created life only on Earth and no where else in the universe? Do you believe, literally, that the rainbow is God's signature of His Covenant with Noah that there will be no more mass extinctions of man? What would be the title of a Bible College course that used some of these questions as the basis to build a syllabus? Have I convinced you that it is reasonable for an intelligent man to believe in Creation? Have I convinced you that Creationism is at least a reasonable argument that should be taught to children as an alternative to speculative science? What observations would you use to run a "duck test" on the idea that God is the creator of everything that exists? As a Creationist, would you ever concede to Darwinism in order to harvest more souls by compromising some truth? Because of His infinite complexity, do we have a language barrier with God that only the Bible, Jesus, and prayer can bridge? Has a cosmologist ever shown that the mathematics underlying a physical phenomenon is related to one of Gödel's Incompleteness Theorems? How would a secular humanists define the word "soul"? Is there a word that means "pride" but also indicates that one is selfless in expressing this emotion? Do you make it a point to direct children to use the word "blessed" instead of "lucky"? Is the author questioning the old version of himself, a militant atheist only 10 years ago? Can you think of any good work in math, science or engineering that is contradicted by one's belief in literal Creation? Why do people laugh when I state that there is no known equation in science to prove that time moves forward? Would you agree that the age of accountability begins when a child no longer takes directions from their parents? Is it not an oxymoron to say that one is a "militant Christian", whereas militancy might exist within other (false) doctrines? If, God forbid, your child died, would you attribute the death to "survival of the fittest" or give your grief to the Lord? Have you ever witnessed the consequences of an entire family leaving church for the rest of their lives because of an untimely family death they blame on God? When a child is old enough to think on their own, isn't it far better for them to replace their parents with God than just rebel against everything? Other than evangelical missions, raising children, and a few other things, what makes you want to remain bound to Earth and not enter eternity now? If I am genetically predisposed to be stubborn, wouldn't it be nice if all my stubbornness was focused on my Faith, thus making me more Faithful? Among Believers, isn't it true that a general fear of death is a Biblical stronghold back to our old non-Believing flesh? Would you say that it is better to read the Lord's Prayer as written or to pray de novo using the Lord's Prayer as an example of a prayer? While one might literally "fight fire with fire" would you agree that it is wrong to fight vengeance with vengeance? In a location where there is a plethora of churches per capita, have doctrinal arguments resulted in daughter churches with doctrinal errors? Does the Catholic Church highlight the Virgin Mary so as to help teach mothers how to care for their children within a properly organized family? No matter what the subject, isn't it always better to walk away from a vitriolic debate? What was the motivation for drafting the "Land Letter" before the 2003 invasion of Iraq? Would you agree that parents should shield their children from the vast majority of videos, TV, music, etc., until the child can discern right from wrong? Would you agree that an atheist could turn to nihilist philosophy under the same conditions where a Christian would simply quote the Book of Revelation? Is the Buddhist Nirvana - the consciousness of nothingness - a form of nihilism which is also anti-Christ? As pre-biotic and Darwinian evolution comprise a nihilistic version of Creation, how can it be taught to children in public school? Would you believe that a six year old child told me that if I love the Lord I will never be alone? Would you like to hold a job where the only person looking over your shoulder and supervising you is Jesus Christ? Even without God, Faith, religion, etc. would not the spontaneous creation of the universe (as is) be a scientifically valid (but highly improbable) hypothesis? Why are we not seeing more mergers of churches? Do you think it is possible to start a new church that would run in a manner similar to those of the First Century? As a disciplinary measure, should a church be able to exercise its power to cast a member out of the local community? What would you say is the primary cause of doctrinal differences amongst Christian churches? Would you categorize the divisive differences amongst Christian churches as anti-Christ? Are there ongoing efforts to unify churches, for example, between the Southern Baptists and Catholics? Whose job will it be to unify all of our Christian churches? Would you agree that most US politicians turn to the Bible only in times of tragedy? Would you agree that discernment over the Bible requires thousands of man years of study and that this is the principle calling of well-formed churches? Can you visualize a world where over-indulgence and proper stewardship are in complete opposition? Do we go through some "Hell on Earth" as a consequence of the Fall in the Garden of Eden, or is it so we can fully appreciate the justice and glory of Heaven? Hypothetically, if mankind had the ability to make the Bible become false by voting, who would vote for "false"? How would you identify and name the medium outside of our space and time from which our universe arose? How would you determine if there is a component of our universe that is without correlation, causation, or logic? In Heaven's library, will The First Three Minutes be in the fiction section? Will The God Delusion be on the bookshelves in Hell? If a perfect vacuum were created at absolute zero, would it necessarily lose its space- and time-like dimensions? Do you absolutely reject the notion of death in favor of an eternal life within the Glory of God through Jesus Christ? Can you name a single public office (secular, religious, academic or otherwise) that has not been unreliable at least one time or another? Is your tongue under better control than your mind? Do you believe that we theists and atheists can find common ground on which to discuss the origin of the universe and man? Other than Jesus Christ, who else has promised to end all lies, hate, suffering, and war on Earth? Would most atheists prefer to live in a country where the state's religion is atheistic and the vast majority of people are also atheists? If you were a child, would you rather that your mother stay home and take care of you or go out into the workforce to supplement the family's income? Why do some women find it offensive to fulfill their Biblical role of loving her husband as he loves Jesus? Would you agree that knowledge alone can't defeat evil? What shall we say of the highly talented men and women who have done no work on Earth for the Lord with their God-given talents? Is there ever an appropriate excuse for a scientist or engineer to work on weapons of mass destruction? Is it appropriate when a child asks about American Indians to explain their history as genocide by our forefathers? Relative to people of faith, do atheists have everything to lose if a Mutual Assured Destruction (MAD) scenario is played out? Do you think God senses all positions and times in the space-time continuum as His present place and time? Did man's concept of infinity develop from an attribute of God? Why does the public perceive people holding high scientific positions to have more integrity than scientists holding more common positions? Used with grade school children, does the term "Mother Earth" detract from the concept of God as Creator? Can you imagine an endowed chair named, "The No Man from Monkey Distinguished Chair" at a Kansas University? How do you reconcile Kierkegaard's leap of faith with Calvin's TULIP? Are Wikipedia editors trying to rewrite history by removing from my biography the fact that I am a signator to Dissent from Darwin? Do you agree with Kierkegaard that one's belief in God overcomes the despair of being mortal? Would you rather learn by listening to men you trust or by reading alone by yourself? Do you think more like a Turing machine or a Domino computer? Were you taught to place scholastic achievement and career goals above family? Will there be calm before the storm, i.e., the return of Jesus? Do atheists believe they are correct beyond a reasonable doubt or by a preponderance of evidence? Does truth that is determined by a consensus vote of men necessarily imply some injustice? How can you help an elderly person who is house-bound and surrounded by middle-age offspring and their children who lie for personal gain? After you are Saved and walking down a corridor that ends with a door saying "Jesus Christ", have all the side exits been blocked by God? Is the Shannon information content stored by a Prigogine dissipative structure, such as a tornado, just debris and increased entropy? Would it be proper of us to think that the Lord is most pleased with us when we are immersed in good works? As a Christian, is it difficult for you to see the insidious Satanic lie behind Buddhism because that religion seems so peaceful? As a Christian, is it difficult for you to see the insidious Satanic lie behind Feng Shui because those practices seem harmless? Would you consider that the practice of trying to force children to speak in Tongues (a Spiritual Gift) is child abuse and anti-Christ? Did you know that boys can be placed in a Buddhist monastery at age 7 by their parents in Thailand, yet US courts would find that practice to be illegal enslavement? Does the promotion of Democracy around the world by Western countries have any basis in Biblical doctrine? If a man has enough money to sustain his family for life, why would he do any work other than what he is called to do by the Lord? Do you see Southern Baptists as situated between, for example, the Methodists and the Pentecostals in terms of their charismatic intensity? Do you think Darwin and Hawking will be overturned in a matter of years or will it be centuries? As of 2011, would you agree that the USA must return to the Christianity of its Forefathers in order to regain the country's equanimity? Are you aware that a Christian Neuroscience Society exists and conducts symposia as satellite meetings to the Biophysical Society? Can teaching esoteric crafts (e.g., wheelwright) form the basis of a ministry because class members bond together? Why can God's design of formal logic be reduced to one simple operation: NAND, i.e., "Not And"? Is NAND the dialectic basis for the inability of Good and Evil to coexistence in Eternity, wherein Evil is finally destroyed by God? Why do some middle aged adults live as if their parents have more authority than God? Is the saying, "charity begins at home", a possible first step by relatives (who are without God) to extort money? Did you know that President Obama quoted the Book of Job twice at very public events within two weeks of each other? For Americans, is the "Time of Job" coming soon? Doesn't it seem probable that there are "fields" known to God that are more fundamental than logic and mathematics? Will man ever discover anything more basic than mathematics and logic? Do you think Hitler was the product of German Existential philosophers? Do you think the German Existential philosophers simply borrowed or rediscovered Buddhism? How can we thank the Lord, present at Creation, for our existence? Can we thank the Lord in prayer or do we also have to live the Christian life by becoming more Christ-like every day? Does becoming more Christ-like lead to fulfilling the Great Commission of going forth and multiplying and making disciples of all nations? Is there anything better than being a slave to a perfect and just Lord who loves us? Why did God design us with specific capabilities and limitations of each of our five senses? Under Darwinian logic, how long would it take for a descendant of man to sense and decipher radio broadcasts? Is it possible some of our late relatives have been beatified by a local consensus of Believers? I found God instantaneously by epiphany when asking a late grandfather for help, so does that attribute a miracle to him? The Bible refers to all Believers as "saints", so what is different about a beatified saint? Would you agree that we should not define a brilliant man by his accolades in business, science, or art, but by the fruit of his Christian life? Have you ever experienced unconditional love with another person? Do you think that it is uncommon for one to be Born Again through epiphany by reaching out to a deceased loved one in Heaven and having God reply? If Christ had come 2,000 years later than He did, would He have to teach on everything from proper child care to the proper use of technology? How can an atheist comprehend, edit, or teach the work of a theist? How would you determine the number of people and institutions that would be directly or indirectly against Christ? Is the secular thought starting in the 1960's just correlated with these menaces or actually caused drug usage, family disintegration, crime, and abuse of children? Do you receive sufficient unconditional love from your family and friends that you can forego the love Jesus has for you? As a Christian lay person, have you ever considered what more would be required of you to become a pastor in a charismatic church? What is the eternal destiny of a pastor who believes in evolution and the big bang - but correctly preaches a Jesus ministry? Can you even start to fathom the quasi-infinite mismatch in intelligence if God tried to explain to man how He created the universe and man? Is it presumptuous to think that science has progressed to even the smallest fraction of what God understands about the universe He created? Do you know of any pastors or church members that are just too intelligent (caveat here) to believe in Creation? Do you know of any church members that work in late term abortion clinics? Are you trusting of confidentiality in Confession or does that make you hold back? When a church has a decision to make, would it not be best to focus on policy, procedure, and planning rather than personal character flaws? Dear God: Are we bearing fruit in this world from the spiritual life that your son, Jesus Christ, taught us? How much more glorious could life be when we are promised that Hope will bring Faith and in the end there will only be Love? Do you find that the best time to write (something of a serious nature) is when you are working through a complex social and spiritual problem involving other people? Would it be feasible for a very good writer to encompass the ideas in this e-book by creating interacting characters with dialogue in a fictional book? Would you agree that Darwinian logic holds true in web-based advertising and news: You get more of what you click (select)? Would you agree that Darwinian logic holds true in the solution of problems with local minima by the implementation of Genetic Algorithms (GAs)? In the first half of the 21st Century will the Middle East fall into the prophecy of Isaiah 19:18-25? Were the physics and biology revolutions of the first and second halves of the 20th Century, respectively, prerequisites to new secular concepts that extinguish Darwin? Because of the war in Heaven and the Fall of man in the Garden, is mankind in quarantine and at war with each other while we carry out the Great Commission? Isn't it ironic that the one thing almost all of mankind agrees upon is the time (minutes and seconds) of the day as given by one standard clock? Could one define "organized religion" as those churches that are franchised and owned by people outside of the local community? Are you aware that in 2008, the United Methodist Church changed its doctrine such that evolution is accepted in place of Creation? Are you aware that in 2008, the United Methodist Church said that Intelligent Design and Creationism should not be taught in public schools? Why is it that church leaders believe that it is permissible to change the literal Word of God to suit their present and future membership solicitations? How are the Methodist Bishops going to explain why they sided with secularists against the teaching of Intelligent Design in public schools? Did the Methodist Bishops swing the Kansas State School Board vote against God? Is it the pastor's job to inform members of his church about doctrinal changes that would be offensive to them if they knew? God: How can I pray for those who change your literal Word when I can't separate their activities from the lies of the Enemy? Should not both parties of an argument apologize to each other and ask for mutual forgiveness because in no argument is one party completely free of sin? What is the authority and source of the doctrine behind Catechism that is not literally taken from the Bible in an expository manner? Would you agree that we owe a lot to the monks of the Middle Ages, and that we should hold them high in Praise for their efforts to keep and disseminate the Holy Bible? If you write a book, will your children and grandchildren know you better after you have past on? Is it correct for a man to walk out of a church and let it be known that it is due to a conflict in doctrine or should he stay and help the church find correct doctrine even if he fails? Is the easy part of a pastor's work Godly and the difficult part man-made? Have you ever questioned whether the actions of Martin Luther caused the church to splinter and thus weaken? Was anyone involved in the Reformation actually interested in grabbing land, property, and wealth from the Catholic Church? Why did such a great man, Pope John Paul II, give in so easily to the false doctrines of Darwinian Evolution and the Big Bang? Why didn't Pope John Paul II realize that science goes through revolutions, the next of which could overthrow both Darwin and Hawking? Does church doctrine ring hollow when an authentic Jesus ministry is used to cover up the abandonment of a literal reading of Genesis 1-2? What religious leader first said: "Don't you believe that the Spirit of God could descend over mankind at any time? ", thus abandoning Genesis 1-2 to non-literal and false doctrine? May I use the acronymn, DYBTTSOGCDOMAAT, for the phrase: "Don't you believe that the Spirit of God could descend over mankind at any time?"? As a biophysicist and apologist for Genesis 1-2, do you expect that I will be declared illegitimate by the scientific community while at odds with weakened church doctrine on Creation? Given the Catholic and Methodist positions on Creation, are the Southern Baptists the next largest church which still believes in a literal reading of Biblical Creation as per Genesis 1-2? Did Pope John Paul II take a calculated risk in mutating Genesis 1-2 so as to have more people come into the church where he knew a Jesus ministry would prevail despite falsification of Creation? Why would anyone believe that man's consensus on truth is superior or even comparable to Biblical doctrine? How can the consensus truth - that mankind finds to be true - be compared to the Truth which God holds? What does a man gain when his five pound brain claims to understand God's Creation in transient scientific terms? What greater insult could we hurl at the Lord than giving scientists the right to rewrite Creation in the ungodly terms of "nothingness and randomness"? What is worse for the spiritual growth of children: Communism or the Darwin-Hawking theology? Why does the USA defend herself against foreign enemies while the homeland decays from immorality, drugs, and profiteering? Are the hands of our doctors being guided by God or by insurance companies demanding minimalistic services? Do doctors avoid performing heroic and God-guided surgery to avoid conflict with their insurance companies that unjustly profit from mediocrity? In Christian terms, is it immoral for an investor to 'short stocks' and then wish for calamities (such as war) to cause stock prices to fall and yield him profit? What percentage of a church's budget should be spent on inter-denominational projects? Do you think it is proper for more than 50% of a church's tithings to go to salary and overhead? Do atheists who believe there is nothingness after death do so because they want to avoid the idea that there might be something horrible after death? Why would anyone blame a child for their "personality and behavioral defects" when such characteristics are directly traceable to the sins of their parents and the other adults in their life? In an adoption or step-child situation, why would any parent use the phrase, "not of my blood", since we are all related through Adam and Eve as reestablished by Noah and his sons? If you wrote a book and it turned out to be unpopular (not even your friends liked it), what would be the most likely cause of failure? If you went to a church and found several good pastors preaching very good doctrine, but the congregation was small, what would you think was wrong? Do you think Kansas is still the most likely state in the USA to have future "monkey trials" over Intelligent Design being taught in schools? Why isn't a liberal state, which enjoys cultural diversity and freedom of speech, the most likely venue for a debate over Intelligent Design being taught in public schools? Are liberals actually highly conservative when they segregate themselves amongst friends, teachers, elected officials, etc., who have like views and little diversity? Is it a test of our Faith that we believe in Creation despite what the secular world and most of our churches say? Is it an extreme test of Faith for those who are highly educated to Believe in Creation? What if the only times you wanted to re-live in your life were those times you were in weekly worship? As we work on a Godly calling, what do we expect to learn from the Lord? Isn't it clear the Baptists, for example, are uncertain that anyone is in Heaven (except Christ), while the Catholics know that many people are in Heaven? Isn't it clear that Paul was the apostle to the Gentiles, while Peter was the apostle to the Jews? Have you not noticed in religious grammar, we use verbosely negated verbs: "Have you not ...", whereas secularists use "Haven't you ..."? Why would people accept a simple Newtonian pendulum in RuBisCo for isotopic preference and radio-carbon dating when the prediction of function from structure in enzymes is at least NP-hard? Why did God have me educated as a secular biophysicist and then as a Biblicist? Why does God hand me now, at 7 years into rebirth and with hundreds of these written questions behind me, into the Catholic Faith which I have resisted to date? Would you put science before Faith just as some place trade before Faith? How have the recent breakthroughs in Biology influenced Christian Apologetics for Genesis 1-2 now that we know the structure of DNA (1955), the genetic code is deciphered (~1960), and the human genome is sequenced (~2000)? As of February 2011 (dated for roll-back and changes in article history), will there be a debate as to whether the fourth figure (codon groupings) in the Wikipedia Genetic Code article indicates Intelligent Design? What will it require to change people's attention from entertainment back to a focus on education? If our society became re-interested in education then would not more people study philosophy and its subdisciplines, including Christian Apologetics? Is the root cause of our people's attention turning from education to entertainment simply a reflection of overall laziness? Have "We the People" become "indexed consumers" such that our education is not very important compared to our penchant for products that influence the global flow of money? Does your church carefully and quietly boast of a special connection to God that might not be present in some nearby churches? Has the growth of cities helped atheists find a place to hide and shelter their personal anonymity while modern communications allows their voices to still be heard? As a question in rhetoric: To whom is it worthwhile to place statements within questions? Which requires more faith: That your heart will continue to beat or that God exists? If on one day you are found to have a dire medical condition and two weeks later you are found to have perfect health, do you attribute this change to faulty equipment or to a miracle? Do you believe that your uniqueness as a human being can be measured, or perhaps even captured for eternity, by future techniques in molecular biology? Would you agree that both Catholic and Protestant denominations are satisfactory to God, so someone calling themselves a Denominational Apologists (such as a Methodist Apologist or a Catholic Apologist) is simply raising membership and tithes for their denomination rather than following the Great Commission as a Christian Apologist? After Jesus returns and there is a new Heaven and Earth, do you think we will still need elected governments, courts, universities, and our current churches? For those that argue the days in Creation are not literal 24 hour days, I would ask you: Don't you think some of the plants and animals God created require an ~24 hour diurnal cycle to survive? Given the continuous turmoil in the Middle East, should not the people begin to place blame on their religion (Jewish and Muslim), convert to Christianity, and find peace? If terrorists destroyed a single US, European, or Israeli city, do you think more people would be reading the Bible in literal rather than story-book terms, including Creation? If a deadly pandemic virus began to kill tens of millions of people, do you think more people would be reading the Bible in literal rather than story-book terms, including Creation? As people grow older and begin to face their own death, do you think they begin reading the Bible in more literal terms - including Genesis 1-2? Did some of the angels that Fell out of Heaven just now make it to Wall Street and Washington D.C.? If a person is thoroughly demonized, do the lies they have been telling themselves become factual truth within their psychologically distorted mind? How do you discern the difference between "everyday drama" and Spiritual Warfare when you come under personal attack in this world? Would more scientists speak out against religious beliefs if their funding was not dependent on a Christian constituency in the voting public? Is the abandonment of literal Creation (which made man unique among animals) correlated with people elevating pets to the status of family members? How many people do you know that have the mindset of their TV set - which then forms the state of mind they have towards you? Could one single lie cause a biological pandemic which would result in the extinction of mankind? Could one single lie become pandemic in nature and extinguish faith in god worldwide? As a Christian, do you hedge your public statements so as not to offend Buddhists, Muslims, and people of other faiths? Does the Catholic practice of praying to Saints imply a hierarchy in Heaven? What does Darwinian evolution predict for the future composition of the biosphere 10 million years from now? How does Darwinian evolution explain compensatory mutations that restore protein structure and function after site-directed mutagenesis has been used to inactivate a protein? Given the vast combinatorial possibilities in DNA sequences, is phylogenetic "Treeing" of rDNA grossly in error because it is uses parameters that are not measurable? Is most of the unculturable diversity in complex environments simply artifactual rDNA sequences generated by recombination during PCR amplification? Do you think people in their 60's and 70's can look back at the major decisions in their lives and see what God's plan was for them? Can an analogy be drawn between mathematical "flat landers" and how we see our lives relative to what God sees? Can you find Biblical reference or evidence that James, John, and Peter were closer to Christ than the other disciples? In the study of seemingly intractable problems (e.g., cancer), is there any chance that the change in one's world-view from atheist to Biblicist might be helpful? Does the phrase "NP, non-algorithmic, or harder" capture the essence of the very difficult mathematics underlying some complex biological and/or cosmological problems? As Believers speaking to atheists, would it not be better to first address the concept of God rather than what some men have done falsely in the name of God? Would you agree that a Christian should not be proud of their work? Is it reasonable to believe that there are present-day apostles that will suffer the same violent fate as the first Apostles? Would you agree that Martin Luther King was an Apostle of the Lord? What has changed since the first Apostles such that present-day apostles can have a wife and family? Should the directors and leaders of PETA be sent to Haiti to work with children? Are all the pets in the world worth less than the life of a single child? Does the use of the term "spontaneous abortion" instead of "miscarriage" somehow make intentional abortion sound more acceptable? Why do some churches restrict Holy Communion to their own members and deny Communion to visitors and guests? If all churches began reading the Bible in literal terms and no other material was added, would we become a single denomination? Why did institutions such as MIT and Berkeley allow the late Steven Weinberg to make aggressively atheistic statements? Did disease come into the world the same time sin came into the world with Adam and Eve's fall? If a research scientist has a closed mind and accepts Darwinian Evolution as fact, are they also likely to go with the mainstream and fail to make revolutionary discoveries? In End Times, will there be an ironic increase in the number of incorrect prophecies of a specific date when the world will end? Would you agree that the proper use of (transiently and earthly) personal fame is to attract and educate others on a path towards the Lord? Is it not more effective to love someone rather than to have power over them? What would our Lord prefer: To have laymen preach pro bono and give tithes to the poor, or to have a salaried pastor preach one service per week? Was denial of literal Creation and Pro-Creation, as described by Genesis 1 and 2, a demonic step towards legalized abortion? Have you ever attempted to find goodness in people who would appear to be your enemies? Would you agree that by being careful to keep the practices of the Amish lifestyle lawful, all of us enjoy greater protection of our civil liberties? What percentage of people do you know that are able to discuss the philosophy of the Vitalism versus Mechanism? Is the difference between GDI (God Did It) and ID (Intelligent Design) analogous to the difference between Vitalism and Mechanism? Is it the belief of Secular Humanists that GDI is a logical subset of ID? Do you have one foot placed firmly in eternity with the second foot ready to follow? Is there no intelligence behind the design of the universe and man? Why did God design us such that there are differing degrees of suffering and pain leading up to our mortal death? If scientists and film producers collaborated to produce films of human life at various stages of human evolution, would the films seem ridiculous? Doesn't it seem both ridiculous and humorous to portray man at earlier stages in Darwinian Evolution as in the films Quest for Fire (1981) and Caveman (1981)? When speaking of the lies brought against Biblical Creation, why isn't the phrase "Darwin-Hawking Tautology" used more frequently? Why isn't the abortion industry viewed by the public as being as systematic and abhorrent as the Holocaust? Compared to 2,000 years ago, has the impact of Jesus on secular men become more offensive than pedagogical? What is the breadth in time (e.g., microseconds) of the present moment of human perception? At the time of Christ, how were debtors forced or encouraged to pay back their debts to money lenders? How can an academic professor profess to study a religion if they have no personal faith in that particular religion? Would anyone really argue over the format of a Christian Cross, with or without the body of Christ, as if He did not or did, respectively, rise from the dead? Are scientists blind to God because they have traded beauty for knowledge? Is the difference between Vitalism and Mechanism analogous to the difference, respectively, between perfect and imperfect equations in physics - given that perfect equations are not known by man? If atheists do not see a redemptive value in suffering, what do they see? Was the mark of Cain carried through the Great Flood within Noah's family? As of May 28, 2012, is Ronald Weinland in high spirits? When Jesus returns and Heaven and Earth unite, what will remain of mankind's legacy in religion, history, mathematics, science, art, music, etc.? Do most preachers have an appropriate level of fear of God when they collect money in His name? Should a good Christian think through possible tragedies in their lives (in advance), so that if anything actually happens they will recall that it is the plan of God and not the fault of God? Would you believe that the strongest faith I have ever seen is within a six year old boy whose reality includes God as a fact? Given that God hates divorce, do you think the Catholic Church has any special privileges with Him to provide for effective annulments? How could an atheist define the term "Born Again"? Is there something special about being Born Again, because the person has in one lifetime argued both sides of the issues related to God? Why is it that the Great Commission so difficult to fulfill within one's own blood-related, extended family? On something as important as evolution, should not scientists be horribly stringent of all elements in the argument before they allow theory to become fact? Via Creation of the Earth, do you think God could have done any better a job in displaying beauty to man? Has there ever been a greater scientific misnomer than calling the Higgs boson the "God particle"? Do you take pleasure in thinking about seeing your deceased relatives again who - probably - made it into Heaven? Would you agree that John 14:13-14 are among the most powerful verses in the Bible, yet there seems to be a limitation on their use to effect change? Are you saddened by the strong trend in Bible Colleges to move away from teaching literal Creation and the Flood of Noah? What do we know about Jesus' physical appearance? Why are we influenced by medieval artists as to the physical appearance of Jesus? Would you be surprised if Jesus was a short, fat, bald man who would not stand out in a crowd of those times? Have you ever felt the love of our Lord come through a spouse to the extent that there is no other explanation other than His love for us? How could a single book, the Quran, written hundreds of years ago, have derailed so many potential Christians into potential violence? How many women have suffered under the blindness created by the lies in the Quran? If Satan is the co-author of the Quran, why do our Christian leaders not just say so instead of appeasing this depravity? What kind of religion would have as a basic tenant: "If you defame or deface our prophet or holy book, we will kill you and your children."? As a Christian, do you find it sickening that any rewards in Heaven would include a harem of virgins? Are Christians afraid of their own potential martyrdom by speaking out against the Quran? Shall we pray that we are known by Jesus and that we can be his grateful servants as he becomes the King of the new, united Earth and Heaven? What is the youngest age you would tell a child about the potential dangers of home invasions, drugs at school, and perverts? With a troubled Christian friend, have you ever said, "Let me look into your eyes", and then, "I think I see some Jesus in there"? Does the adage, "Like father, like son", include generational sins which a father must be careful not to transfer to his son? In marriage amongst Christians, if you had more than one soul mate on Earth, what will you find in Heaven? Should Christians read, "God, Country, and family" as, "God, neighbor, and family"
Why would a Thai Buddhist call their king: "God Greater than the Land"? As Christians, are we not blessed to have a God who has personified and revealed Himself to us in the paradoxical form of a mortal man? In defining what it means to be alive, how would you compare and contrast the characteristics of a bacterium with the physical phenomenon of fire? What major characteristics of living organisms can be described by discrete mathematics? Rather than looking for God in sub-atomic particles or in cosmological structures, would it not be better for scientists to look for God's signature in these places? If the human brain could solve an NP problem as fast as it can now check that it is correct, what would we be able to perceive? Why has S. Hawking received more attention that P.C.W. Davies, S. Wolfram, et alia, combined? Were the apostles told to go out by twos so that they served as witnesses for each other such that they could not be accused of a crime by a percipient liar? If the US government degenerates to the point where it is equivalent to a legal, organized, criminal institution, will it still have the authority of Romans 13:1? Must prayer be verbose or can it take the form of nebulous concerns where one knows the Lord is listening to our thoughts? For those people who "zone" - i.e., emulate the life of a deceased person they seek to magically mimic - might I suggest Christ? Is it not ironic that a Buddhist who has reached a so-called "high state of meditative prayer" nonetheless succumbs to the simplest of sins, i.e., judging others to be of a lower status? Is it not a matter of faith that the human brain can understand the mechanisms of the universe and the appearance of man by scientific inquiry, and why is it that those of us who believe not are exiled and label illegitimate scientists? When in the past has there ever been a religious war where one side was secular? Would you agree that a Charismatic Neo-Pentecostal Church is best for the greatest of sinners, such as myself? Is not the concept of "missing the boat" as important now as it was in the time of Noah? What percentage of atheists would see Darwinian Evolution as a "wishful joke" - as I did as an atheist? Is our perception of the present moment on about the same time scale as our discernment of video frames - approximately 1/30th of a second? Is it not paradoxical that Jesus Christ was both a mortal man and also as much of God that man could stand to see or comprehend? If we spoke of social Darwinian Evolution, how did our U.S. government decide to select - through financial benefits - young, single women with children? Is there a Biblical prophecy that "we the people" would become a handicap to the US government to the extent we are to stay in lethargy at home, watch depraved video, and receive a small check? 50 years ago, who would have prophesied that gay marriage and abortion would become divisive political issues? With death right around the corner, what intrinsic deceptions must we accept to function within a world where Satan is the Prince of the Air? Could Evolution and the Big Bang be considered a litany of curses against God even though it was not the primary intent of the authors? Is the bias in scientific study likely to be fortified with data mining aimed at increasing one's self glory and wealth? Have Christian Apologists studied the impressions that modern media have on the (normally playful) fantasy life of children and the resultant effects on their adult spiritual life? Is it Grace that allows a child to mature to discern that Santa Claus is false and Jesus is true? Do I state nothing because I know little, and I know I know little, so I ask many questions? Is it not ironic that no scientist will ever gain the fame of even a minor player in the Book of Genesis up to and including the time of Abram? Can you name any invention that has brought only good into the world? After the Fall in the Garden, would it not seem true that all inventions bring both good and evil into the world? Do God's plans for man enable invention almost up to the level of self-annihilation (thermonuclear weapons) but no further (e.g., creation of a black hole)? Is there even the slightest possibility that some of these questions are inspired by God? If in one's spiritual life on Earth, they for some reason wanted to act like a lawyer, would they find their best fit in a Calvinist church? Is not Creation the definition of beauty? After we take firm, opposing positions in bipolar debates (e.g., theist versus atheist), are there not some strong doubts on both sides? Will a policy of appeasement with demonic forces lead to self depravity? If a lookup table shows patterns as to how one set is mapped onto another, does that imply intelligent design? How does a pattern evolve from randomness? With negentropy attributed to energy and mass flow through an open thermodynamic system, did Prigogine Theory further anticipate the evolution of intelligent lookup tables? If Christians are willing to discuss their doubts and lapses in Faith, why are scientists so adamant about Darwinian Evolution to an extent that there is no discussion or teaching of Intelligent Design, panspermia, the Anthropic Principle, God, etc. If a type of faith comes with no doubts or lapses in faith, should not that type of faith be called fascism (at the level of a society) and denial (at the level of individuals)? If a non-Christian feels compelled to give you some "psychological advise", should you not first ask them to explain the Book of Revelation to you? Under the Darwin-Hawking, would you agree the the possibility of man existing is approximately 1/∞, and the probability of a particular man existing is 1/∞/∞ ? Would atheists in the US likely convert to Christianity if they suddenly found themselves living under Islamic leadership in an Islamic neighborhood with Islamic Law in place? Would you agree that this statement does not fulfill the Great Commission: "We should come together, whatever god you believe in."? Is it a sin for a sinful man be writing about God? After studying your friends sin (and as a hypocrite), is it not a good idea to reflect on yourself? Have you noticed that expatriots of the Philippines often live an excellent Christian life - largely due to a government that is almost a Catholic Theocracy? Are you aware of an organization named "Theocracy Watch", which at this time is the highest ranked site for a search of the word "theocracy"? In which type of country would you prefer to live: Islamic Theocracy, Communist, one formed by the leaders of Theocracy Watch, or a Feng Shui Theocracy? If depravity precedes war, what comes afterwards? How does the Lord modify the Book of Life to judge a man who is slowly developing a dementia? Is capital punishment an error in our justice system because it deprives a man of enough time to repent? Was there perverted behavior in Berlin during the early 1930's that helped usher in Nazi fascism? Looking into the future, did the symbolic presence of Bin Laden influence world budgets by as much as one thousand trillion (1015) dollars? Would the definition of life, which excludes viruses as living, be better defined if the criterion for life requires bootstrapped DNA, whereas some viral and bacteriophage life cycles can be started from pure DNA? Might God have been in a dream-like state when He created the universe and man? Could, "Created in the image of God", be read in part as to the likeness between man and God's dreams? Does the Book of Life hold us accountable for the content of our dreams? If we could rapidly solve very large, mathematically over-determined systems of variables and equations, would that be a step forward - getting us partially around the very strong likelihood that P is not equal to NP? Could an uninformed person take the term "spiritual warfare" to mean some kind of Christian violence against non-Believers? Could the phrase "entry into the Book of Life" imply violence or suicide to an uninformed person? Is not peace of mind an Earthly reward for living a Christian life which can only be quenched by moments of disbelief? Outside of Christianity, in a world of different religions and secular ideologies, is there something analogous to forgiveness? Within biophysical systems, are there negentropy counterparts for the three types of entropy describe in the equations of Gibbs, Boltzman, and Shannon? The equivalence of the entropy described by Gibbs versus Boltzmann is taken to indicate the link between thermodynamics and statistical mechanics - but does that equivalence also include the discrete informational entropy of Shannon? What is the biophysical mechanism that leads to discrete (Shannon) information discovery and storage in a biosphere comprised of organisms that are diverse, interdependent, and numerous? Given that you have at least one Spiritual Gift (ranging from prophet to humility), do you display this gift to others (both inside and outside of church), and do others recognize your gift? Would you agree "drugs destroy families", yet the Lord gave us homemade wine for our limited use and pleasure? If a government tortures and murders people, are the tax payers held accountable by the Lord? Will the Lord see as justifiable - based only on probabilities - a preemptive strike by a government's military on an enemy? If a number of countries began preemptive military strikes on each other, based only on the probability that they are protecting their citizens at home, would the final world war ensue? If you are not working for the Lord, for whom, exactly, are you working? Is the love of money the root of all evil because, in part, man believes he can buy love with money? Without God and mankind, would not the biosphere become a futile cycle? Would not any man be a futile cycle without the Lord? Is man (and his inventions) the only entity on Earth that can convert analog information into digital information? Prior to eating of the apple from the Tree of Knowledge, was man incapable of converting analog into digital information? Is sentience the medium in which the logic of morality is calculated? How is it that so many people have given their life for the liberties of the USA only to have some liberties curtailed by the voices of self-righteous atheists - having no similarities to our Founding Fathers who espoused, "One Nation Founded Under God"? Have you ever noticed how some businesses accommodate both atheists and theists through slogans: "He who plays hardest wins" versus "Believe", respectively? Could the term "Cinderella Syndrome" be coined to describe a child who expects his stepmother to be hostile simply because of the Cinderella fairytale? Given the prefix "a" means "without", would it not be better to convey the intended meaning of the word "atheist" as "anti-theist", given that no one is without all faith? Would the argument over god in school change if atheists properly represented themselves as anti-theists? What is the moral basis for an atheist deciding among alternative philosophies such as nihilism, fascism, and materialism? Calling themselves atheists, are anti-theists most likely to promote the Darwin-Hawking tautology as textbook material for public schools? Must a student accept the anti-theist Darwin-Hawking tautology to pass standardized tests? Is the state forcing teachers in public schools to be sinful as they are required to teach the false but god-like Darwin-Hawking tautology - without question - while they believe in the true God of Abraham? Are public school teachers being forced to teach the doctrine of the anti-Christ, i.e., the Darwin-Hawking tautology? Would you agree that God has not only solved all of mathematics, moreover, He invented mathematics and other fields too complex for the human mind even to grasp in a simplistic, outline form? How could anyone other than Jesus Christ walk through this world and be full of empathy, as that would cause a normal man to take on much more than he could endure? If a man walks through this world with empathy, what on average would he feel from the people around him? If you have an unresolvable problem, do you share the burden with your family and friends, or do you give it directly to the Lord? Is this consistent with an atheist persepective on life: "He who plays the longest and hardest, wins."? Is this consistent with an atheistic view of behavior: "You can always tell what a person will do, because they are out for everything they can get."? Is this consistent with an atheist view of death: "He who dies with the most toys, wins."? In financial matters, is "eating crow" an atheist form of humility, except that it is designed to enhance delayed financial gain? Is caring for "mother earth" an atheistic form of proper stewardship of the Creation as taught in Christianity? Why is it easier to capture the beauty of God's Creation through pictures rather than words? If Hitler used Darwin, who will use Hawking? If you were reading an article online and saw the phrase, "Darwinian Psychology", would you follow it? If you were reading an article online and saw the phrase, "Extinguish Darwin", would you follow it? Did you know nonbelievers think calling someone a "Creationist" is a slur equivalent to "an idot holding an unshakeable right-wing position"? Would you be afraid to be labeled a "Creationist" even though it is your actual belief? Should the Roman Catholic Church have a process opposite that of beautification for the designation of certain people (e.g., Adolf Hitler) who are most certainly in Hell? Does the Book of Revelation contain dream-like allegory consistent with the USA employing missile-firing drones in a dozen different Muslim countries? Did the Book of Revelation prophesy the medieval crusades and the current War on Terror? Did the Book of Revelation prophesy the Cold War? Is a "War on Terror" synonymous with a fight against Satan? How does one have a war with an emotion, i.e., terror? With their claim of being Christian, has the US administration realized that it is futile to use high tech war machines against Satan? In the Western countries, do you think many present-day atheists have made a break from centuries of Christianity in their families? Is forgiveness the spiritual analog of a stealth fighter? Once a wealthy Christian man understands that only God's work is important, should he spend his money to create jobs in places where the basic economy is poor? How would you feel about the word "raw" if you were described as having "more raw intelligence than any other man on Earth"? Is your brain simply a domino computer with highly engineered differences in delays between inputs so as not to create a simple, logical truth table? For a brief period of time prior to the Fall, did Adam and Eve enjoy free will absent of sin? If the highest goal of an altruistic atheist society is Peace on Earth, who would establish that peace and what would be done with sin? Absent supernatural forces, would not the biosphere collapse into low diversity and then total extinction? Can demonization be seen as an accumulation of lies within a person who is open to accepting the very many lies of Satan? Is our culture the medium through which demons move? Why do some Christians see demons as entities that can move from person to person, and thus they are afraid to help demonized people? If Satan is the Father of all Lies, then are bits of gossip his children? On what Biblical basis will the Jews be judged both before and after Christ? If a person has a severe physical handicap, for what can they hope other than the promise of a new body via Christ? Are any of the 144,000 alive today? Is it a Satanic lie that only those who claim to be "Born Again" will be judged at the Gates of Heaven? Who on Earth benefits by saying only the "Born Again" will be judged at the Gates of Heaven? How does one draw the lines between metaphysics, physics, and epistemology both with and without the Christian perspective? Scientists know from history that revolutionary work has come from questioning the very basis of their then current theories, so why are foundational questions on God, Faith, and Belief now rejected without any consideration? If we look at mankind through thermodynamics instead of spiritual beliefs, are we nothing more than about ten billion heaters? Should it be impressed more thoroughly on people that without Christ we have no way of ridding ourselves of sin, and that life is not simply a scale that weighs doing good against doing evil? Was not the Holocaust perpetrated by atheists who extended the depravity of earlier atheist philosophers? Is the Holocaust copesthetic with Chapter 20 of the Book of Revelation, and is this analysis well known by eschatologist? Is it delusional to believe that anyone other than Jesus Christ is infallible? Is it delusional to believe that there has been a 2,000 year line of succession of Roman Catholic Popes - all of whom were infallible - and who received divine guidance over doctrine which has no literal basis in the Holy Bible? Has anyone ever interviewed a Pope to ask how it feels, upon installation to the position, to make the transition from fallibility to infallibility? Would you agree that no text in the Bible supports the idea that Peter would become infallible after the crucifixion of Christ? In a Catholic Church, why must a Born Again Christian cross their arms over their chest at Communion and then be skipped over by the Priest and denied the Body and Blood of Jesus Christ? From the Catholic viewpoint, how can Billy Graham be anything more than another heretic? Has the work of the Southern Baptist Church in worldwide missions, guided by the Great Commission of Jesus Christ, been carried out in what Catholics would define as heresy? Is the baptism of an unknowing infant by a Priest and the child's parents superior to the baptism of an adult Believer that has come forward under his own free will? If one parent shows disrespect for the other parent, will their child learn to disrespect one or both parents? When you read the Book of Revelation, do you try to put the United States, or the United Nations, or the Roman Catholic Church in perspective? Do you consider suffering and inspiration to be interwoven by God? If the Apostle Paul were alive today, would he say: "I don't know for certain, but I think the heart of Jesus is within the Southern Baptist Church."? Was Martin Luther rightfully concerned about the selling and granting of Purgatory indulgences when he initiated the Protestant Reformation? By his Covenant with Noah, did the Lord prevent the "Missiles of October" 1961 from being fired? With single factories capable of producing over 10 billion pills per year - and by their love of money - have Western doctors turned our population into addicts? Is the portrayal of medical remedies as a science a ploy to extract money from unsuspecting patients? Do medical doctors enrich themselves through their patients fear of death - something that a Christian should understand as passage into Heaven? Why does the popular media use the word "lost", e.g., "lost her battle with cancer", when a Christian should see this as a joyous entry into Heaven? Do you think that many medical doctors who portray medicine as a science know that there are no exact solutions in science for any system larger than a hydrogen atom? If a medical doctor donates some of their time to missions work or to the poor, can they say that their work is motivated by Christianity or is such charity a ploy to enhance their standing and enrich themselves with more money? Are hospital administrators mainly concerned about improving medical care for patients or do they have a strong motivation to increase salaries out of the love for money? Is there no cure for cancer because researchers are dealing with systems too complex to be comprehended by man? During an interview for admission to medical school, would there be a strong bias to reject a qualified student because they believe in a literal interpretation of Genesis 1-2? If you are a non-Believer and in a very difficult situation, would you actually tell me not to pray for you if I offered to do so? Do you really think that all of what you are was born into this world through the information content of one ovum and one sperm? Do you ever say, "I love you Lord"? Should the Correspondence Principle from physics be extended to include all tautologies, for example with Catholicism enlarging the scope of the Holy Bible? Would the "best bet" in Pascal's Wager include the acceptance of Purgatory? Will the next major advance in our civilization be the use of partial solutions to the P = NP problem? Have mathematicians completely defined tautologies? Is a tautology discarded when it is encompassed by a newer tautology that extends it to be more descriptive, inclusive, and predictive of the complexities in our universe? Why do people believe that a majority vote in a referendum makes a certain sinful behavior into something free of sin? With all earthly authority arising from God, is one of the biggest components of free will the ability of our leaders to do wrong? Can these four postulates be disproved by science? Humans can not observe the origin of the universe or life on Earth. Without cause, intelligence, god, or a Big Bang, (etc. ), the universe and man came into existence about 10,000 years ago in a state similar to the conditions we observe now (as is). This "no intelligence event" was caused by a physical event analogous to NP or non-algorithmic mathematics. Optionally, postulate (2) can be biased by a process that can not be proved correct, such as intelligent design, god-driven, or Big Bang-theorized (etc.) mechanisms. As I write, I am truly blessed to have my wife Josie and my son Joel by my side.